Life insurance is nobody’s favorite subject of conversation. Most people associate life insurance with expensive monthly premiums and, more importantly, their own mortality. For that reason, many people aren’t sure how life insurance works, or what their options are. However, thinking about your life insurance policy is very important! It is intended to lessen the impact of death on your loved ones, and it doesn’t even have to be expensive. Below, we discuss the major differences between term life insurance and whole life insurance to help you determine which one may be best for you. Term life insurance is a simpler, cheaper type of life insurance that’s a great way to institute a policy without having to cut too deep into monthly expenses. 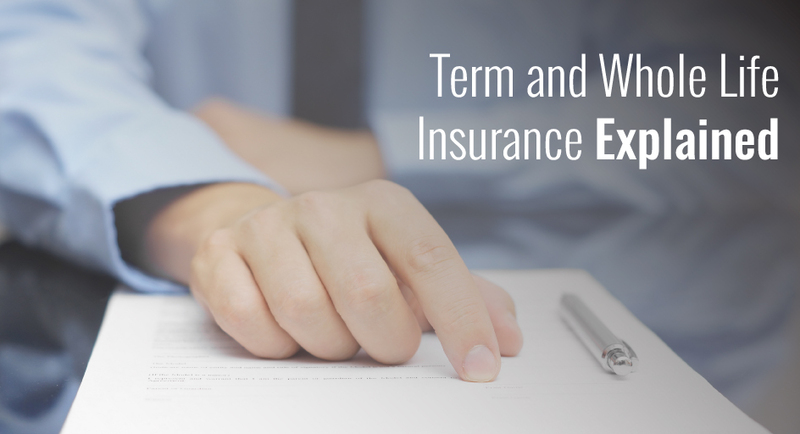 Term life is purchased for a specific time period, anywhere from 5 to 30 years. Death benefits will only be paid if the death occurs during the term of the policy. More often than not, term life will become much more expensive as you age. After the age of 50, the cost of term life quickly creeps up to the cost of permanent life insurance, so you should look into getting it sooner rather than later. Also, these policies can also be converted into whole life insurance in some cases, which is another option if you feel like it may be the time to consider whole life. Term life insurance covers you for a set period of time, while whole life does exactly what you’d expect: it covers you for your whole life! Not only does it provide death benefits when the time comes, but it also provides a cash value accumulation that builds during the life of the policy. This means that you can actually see payoffs of your premium at a certain time, sort of similar to a retirement policy with your employer. It usually takes anywhere from 12 to 15 years to build up a considerable cash value. This cash value is based on how much the return on investment is worth. Acquiring a whole life policy does usually mean a medical examination, but this is not always the case. Sometimes, with a higher premium, whole life insurance can be purchased without a health examination. This type of insurance works great for estate planning, and although it is initially more expensive, you can potentially save money through whole life insurance in the long run. Be sure to see what works best for your finances by speaking with a risk advisor today. Although that may be a long list, factoring in as much as possible is important because life insurance is a big investment. Give our agency a call today so we can help find you the best policy for you and your family.